Hi, Momeveryone! I’m all done being pregnant and having a baby, plus I just got back from Stampin’ Up! Convention, so I’m fired up, ready to stamp, and ready to blog. 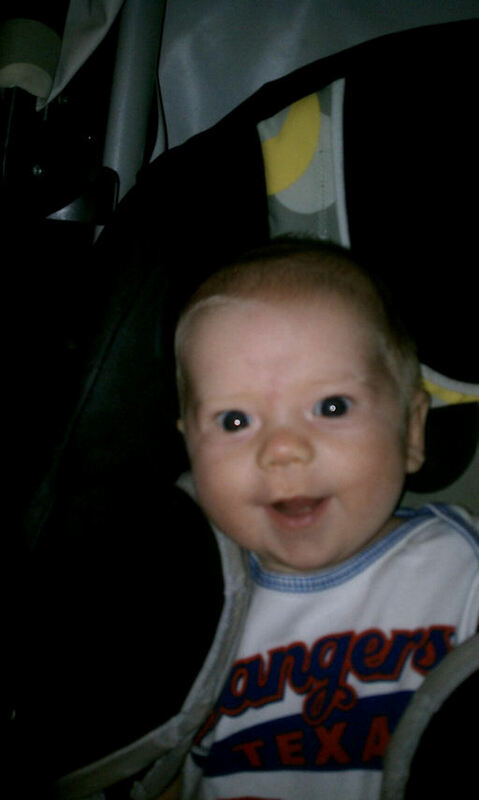 Speaking of babies, I took this little cutie with me to Convention, and he was an absolute angel. Easiest baby ever (knock on a wood block!). At Convention, SU! revealed several new products (over which I drooled, and Moma lot of you will, too). One of the new products is called “Undefined”. In the main kit ($19.95 US), you get wood blocks, rubber, mounting foam, 2 carving tools (one for carving out large pieces, the other for detailed carving), an Island Indigo marker, detailed instructions, templates, and postcards. I wasn’t quite sure about the kit when they first announced it, because, hey — what in the world would I carve? That’s why I’m with Stampin’ Up! They make great designs, and all I have to do is stamp them on my projects. But then I decided to give it a try, and while I stood in line, I had an *aha* moment. My almost-3-year-old daughter, Buttercup, inherited her mother’s obsessive personality and has been obsessed with kitties for quite some time. For several months, every day, “Mommy, will you draw a red kitty?” (also obsessed with the color red). I’ve drawn hundreds, possibly thousands, of red kitties, and maybe I’m just a weensy bit tired of DRAWING BLASTED KITTIES. Oh, Undefined, how I love you. I am the world’s best kitty artist. This is an accurate representation of our cat Minerva (full name Professor Minerva McGonagall), also known as Max-erva, Fat-erva, and Calico Fatz. I always draw this exact kitty. 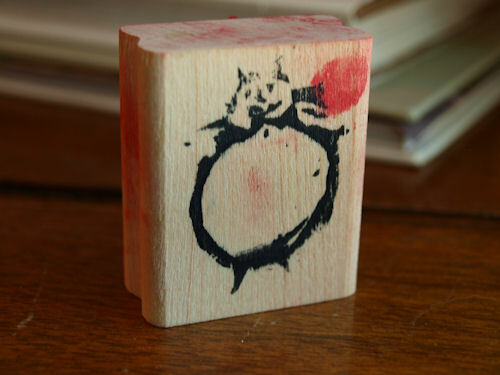 I decided to carve a kitty stamp for Buttercup. By the way, use a thimble, kids. Those tools are sharp, and I’m not saying I stabbed myself, bled all over the rubber, and had to request a Band-Aid [which they had on-hand, since I’m not the first to bludgeon my thumb], but I’m not saying I didn’t. In addition to the thimble, I recommend that you don’t choose an intricate design, such as a kitty face with kitty whiskers and a kitty tail (which I accidentally cut off — poor kitty). At least for your first shot at it. I’m pretty proud of the way the stamp turned out. It isn’t perfect, but I had a total “I made this!” moment when I was finished with it (it took 15 minutes, BTW). I could make a better version when my kit arrives in the mail this week (um, YEAH, I ordered this), but I don’t think so — I like it as it is. Don’t tell Buttercup I stole her stamp. I couldn’t wait to show you my handiwork, so I grabbed the latest sketch at Freshly Made Sketches and whipped up a quick card. I did give poor kitty a tail using my Real Red marker. The sentiment (appropriate for Minerva, especially the “much” part) is from the Yippee-Skippee! set, which was, as Shelli called it, a party favor for everyone in attendance at Convention. Yippee-Skippee, indeed. 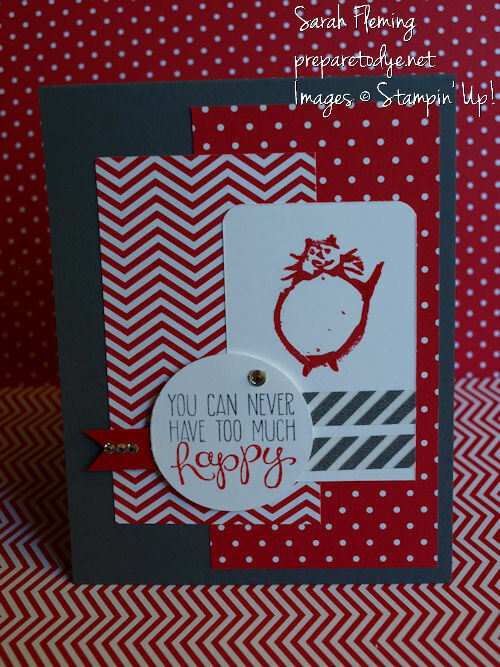 Make sure to visit my Stampin’ Up! 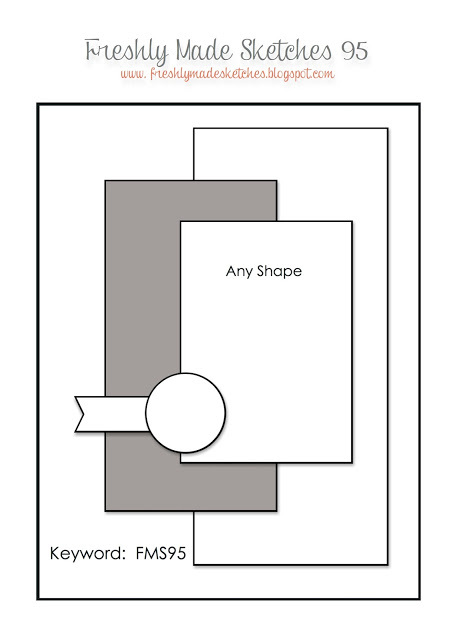 store to get your Undefined kit. Prepare to dye! I don’t think I’ve ever seen such a cute kitty! Thanks for taking us through your creative process! LOL, that was quite a story! And thanks for joining us at Freshly Made Sketches! Thank you, Jen! It was a fun sketch to work with! I love the Minerva stamp! The little blood spots are adorable!